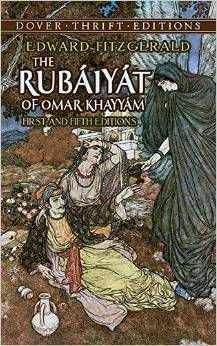 Everything I know about Omar Khayyam comes from this book. 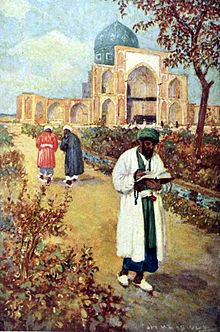 Khayyam was born in Nishappur Iran, in 1048, word has it to a family of tent-makers (khayyami means tent-maker in Arabic). He was a famed astronomer and mathematician during his own lifetime: calculated the solar year (correct to six decimal places) which laid the foundation for the modern Iranian calendar; laid out the principles of Algebra that eventually made their way to Europe (with a particular emphasis on cubic equations and non-Euclidean Geometry); and was the first to demonstrate that, rather than the universe moving around the earth, the earth actually rotates on its own axis. Rumor has it that he also postulated a heliocentric theory “well before Copernicus,” (and in the lines of the Rubiyat, no less), though that’s been disputed more recently. On top of all of those accomplishments, he managed to stack a thousand or so four-line verses like the ones above. His poetry didn’t get much attention until eight centuries after his death, when a British fellow translated them for the western world and in so doing also managed to re-introduced them to the east. Anyway, Khayyam was a genius. At the tomb of Omar Khayyam. (A painting by Jay Hambridge). About the illusion of time and the false comfort that delete buttons and second drafts provide. About the limits of even the wisest editors and most patient friends to help you claim the thing you are grasping at. And ultimately about the irrevocability of your own voice. Previous Previous post: Walt Whitman. Because let’s make it a poetry week. Next Next post: On Theodore Rothke and misinterpretation.